In the previous eleven articles of this series we sketched the historical and cultural background of the Dharma coming to Tibet from India, and then specifically presented the seven-step process of learning to read the Tibetan script. All of the essentials of learning the script have been covered. In this article, I would like to present a few more details to complete the picture. 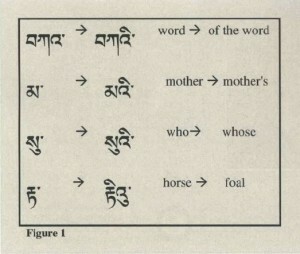 The subjects covered in this article correspond to Appendices II and III of my manual, Introduction to Tibetan: Level I.